Dock spiders or “fishing” spiders are a big part of the cottage experience in Canada and the United States. Here are some interesting facts about these amazing cabin residents. The scientific name for a dock spider is Dolomedes and it belongs to the Pisauridae family of spiders. In Canada, the spider is usually referred to as a dock spider. In the U.S., it is often called a fishing spider. Other names include wharf spider and raft spider. Dock spiders are widely distributed throughout cottage country. 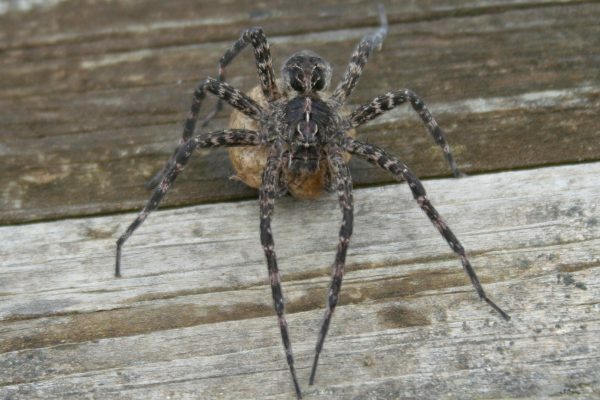 Whether your cabin is in Michigan, Wisconsin, Minnesota, Manitoba, Ontario, Quebec or any other lake-country area the dock spider is a regular and often feared companion at the cottage. Big female fishing spiders tend to be the ones we see most often on the dock. This is their prime territory for hunting aquatic insects, minnows, tadpoles or any other meal that happens to float or swim by. Smaller dock spiders are often found around the cabin, shed or outhouse and will feed on a variety of insects and bugs. This one caught a daddy-long-legs on the cottage deck. Like most spiders, dock spiders use venom to paralyze their victims. Fortunately, they have little interest in people. Dock spiders are generally not aggressive regarding humans and will usually hide when we approach. 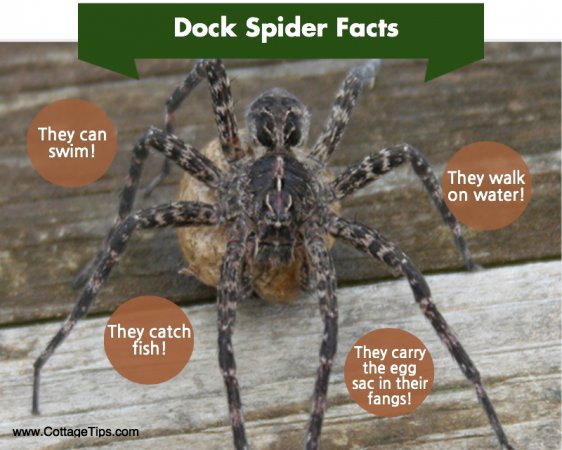 A dock spider will only bite a person in the rare situation that the spider feels threatened, for instance if the female spider is protecting its young. Unless you grab the spider or inadvertently step on it, you will likely never be bitten. A dock spider has large enough fangs to break the skin, but a bite is not dangerous to humans unless the person has an allergic reaction to the bite. Dock spiders are Canada’s largest spiders. A female dock spider can grow to be more than 3.5 inches or roughly nine centimetres. The one shown above was photographed sitting on a shirt about three feet from the bed in the cottage. A dock spider can actually swim under water and stay submerged for several minutes. It uses air bubbles trapped in the fine hairs on its body under its belly to provide oxygen while it is under water – a bit like a dock spider scuba dive. Dock spiders seem to defy gravity and will walk along the surface of the water. They can do this because their feet do not get wet and their weight is distributed in a way that the surface tension of the water is not broken. A female dock spider will carry the large egg sac in its fangs or with its front legs until the young spiders are ready to hatch. The female chooses a safe place for the egg sac and surrounds it with a protective web and then stands guard until the baby dock spiders hatch. Each egg sac contains hundreds of baby dock spiders. It is an unnerving sight when we discover them just after they have hatched – especially when the mother spider has decided to hide the egg sac somewhere in the boat. Read a horrifying dock spider story about what happened when our editor accidentally stuck his hand into a dock spider’s nursery web.